You want to produce and store your own photovoltaic energy on an isolated rural site ? One of your facility is too far from the grid to be connected? Do you want to take action for the environment with a sustainable electricity? For rural electrification of a site too far from the grid to be connected, the production of renewable energy in remote site is the solution. Operation is simple: solar photovoltaic modules produce electricity during the day. 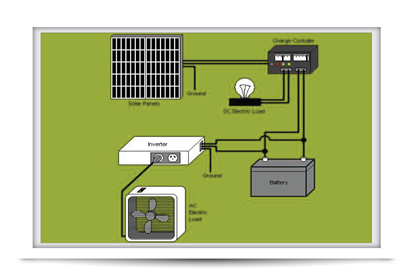 The photovoltaic energy is stored by batteries that restore electrical power as needed. SOLARIA puts his skills to the production of solar photovoltaic renewable energy in the service of the electrification of isolated sites and agricultural and offers a "turnkey" photovoltaic solutions to capture, produce and store electrical energy in isolated areas. Feel free to ask us for a quotation. For the use of renewable energy for electricity production in the agricultural sector: A premium of 40% of the cost of the investment with a maximum of 20,000 dinars is granted for lighting projects and rural water pumping by solar energy for farms and rural projects.